This is an exciting time at the Dalia Association. We have recruited two new staff members. Rasha Sansur started in May 2016 serving as communications and reporting officer. Our Facebook and Twitter accounts have been reinvigorated. Lina Isma’il started mid-May 2016 serving as community programs officer. Lina will oversee our community programs including the Village Decides and Women Supporting Women programs. Lina will also lead the pilot implementation of our new program, Youth Empowerment, Youth Grantmaking. We are thrilled to have Rasha and Lina join the team. We are also focused on developing local as well as Diaspora and Solidarity philanthropy in Palestine. Last month, we organized and facilitated multiple occasions to discuss philanthropy and the return to our indigenous support system of al ouna. There is a growing interest (an increasing urgency) in developing mechanisms and models to invest in the resources that already exist in our country, and free ourselves from the continued dependence on international aid. Over fifty grassroots activists and concerned citizens gathered at the Dalia Association to discuss models to develop a more local economy in which resources are activated even when monetary means are lacking, where food sovereignty and local tourism are realized, and a sustainability is attained where there is no waste or leakage to external systems or markets or landfills. Gatherings were also facilitated with local grassroots organizations and initiatives as well as civil society to share experiences with mobilizing resources that exist within our Diaspora and our friends in solidarity around the world. Again, there is a growing awareness that Diaspora and solidarity resources, along with our local resources, can and should support Palestinian communities and their sumood in Palestine. The key is connecting resources locally and globally with Palestinian communities. It is every community’s right to determine its priorities for development and use the available resources towards its progress. The Dalia Association strives to ensure that mobilized resources are channeled towards initiatives and priorities that are community led and community controlled.Community led and community controlled is essential. Supporting civil society initiatives over the long term is critical. We recently have been researching models of grassroots fundraising and crowd funding. Leaders in this field stress the importance of raising funds for very clear and specific purposes, i.e. build two new schools, or feed 500 vulnerable children. These experts persist that such narrow campaigns will raise much more funds than a general request to support communities. We insist that mobilizing resources should be more flexible as community priorities and initiatives evolve and change with time and circumstances. We believe that our friends in solidarity want to support Palestinian communities to address key issues as they arise. Rasha Sansur, Communication and reporting officer. Born in Jerusalem. She graduated with honors from Birzeit University in 2011 majoring in Journalism with a minor in Sociology. Rasha's experience include working at the Department of Public Information at the United Nations in New York City, as well as with the German Development Organization GIZ, consulting for Water Union Service Providers, and coordinating a children's choir project for Edward Said National Conservatory of Music. She did voluntary work at Passion Works Studio in Ohio, for people with developmental disability. In 2015, she earned a master’s degree in Communication and Development, from the Center for International studies at Ohio University through a MEROL Scholarship. She aims at using her skills to influence positive social changes in Palestine, as well as effectively working on changing the negative stereotypes often associated with Palestinians. In her free time, Rasha enjoys photography, hiking, singing, playing flute, composing music, and doing sports. Lina Ismail. Community Programs officer. 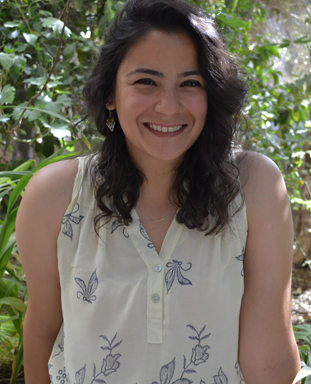 Originally from ‘Asira al-Shamaliya, Lina lived part of her life abroad and returned to Palestine, she majored in Biology for her Bachelor’s degree and furthered her Masters education in Environmental Sciences, Policy and Management. Lina volunteers at Sharaka Community Supported Agriculture, a volunteer group that aims to support small-scale traditional farmers, holding the principles of food sovereignty and preservation of Palestine's traditional agriculture. She also volunteers at eco projects/initiatives in Palestine, such as Farkha eco-village and Marda Permaculture Farm. Lina co-produced the guidebook ‘Conscious Choices’ with her friend, the researcher and activist Muna Dajani, discussing the concept of ethical consumption in the Palestinian context and the importance of supporting local production, by shedding light on a number of local producers including farmers, craftspeople and shops. Professional wise, Lina worked in environmental and development fields in public, private and NGO sectors in Palestine, and she finally found a place that aligns with her ideology and approach, at Dalia Association.She is a strong believer in collective thinking and actions, in addition to the role of grassroots movements and the spirit of volunteerism in community development and liberation of nations. New Board Members: Shadi Samer Shawkat Abdelhadi; Yanal M.Y Hammouda; Siham Amin Rashid; Najla A.S. Shawa; Sami Alalul, Fida Touma. New General Assembly members: Nader Dagher; Ashira Ramadan; Ryad Ayassi. Dalia Association visited Susya over the last couple of months, and discussed the women’s priorities with the community, and the idea of income generation and alternative tourism was discussed, so the Farashe Yoga Center board, on which the Dalia Association director serves, decided to hold their first Yoga retreat in Susya, in an effort to raise awareness and show solidarity with the village threatened daily by nearby Israeli colonial settlers. With the help of a bus rented from the Women’s Association of Beit Surik, a diverse group of Palestinians and Internationals spent the weekend of April the 22nd in Susya, generating income for the threatened village, and building a resilient community. The sound of the stream, and the smell of the herbs that have been tickled by the passing breeze was surrounding members from the Ramallah Women Fund on agricultural land in Beit Surik. The members include the Birzeit Women Charity Association, The Women’s Association of Qarawa Bani Zeid and the Women’s Association of Beit Surik. They visited the agricultural project which was implemented by the Ramallah Women Fund, part of Dalia Association‘s “Women supporting Women” program. The project was implemented by The Women’s Association of Beit Surik, on unused land, and the crops were watered with unused clean natural spring water, without chemical pesticides. The collected crops are later used for the Associations’ food production, which are sold in the village schools. This raises awareness among the local community on the importance of engaging in local natural agriculture, in addition, to the role of women’s support to carry out projects which contribute to the material and moral benefit of the local community.The project to support The Women’s Association of Beit Surik was unanimously approved by all the members of the Ramallah Women Fund. Dalia Association linked Rural Women’s Association of Hebron with Sidreh’s Women’s group of Naqab in an effort to exchange expertise and knowledge in wool crafting. This will enable southern Hebron communities to use their resources to generate income for a sustainable future. When you are surrounded by a negative atmosphere it gets very hard to see or feel the positive things around you. As Palestinians we are surrounded with very negative experiences due to the Israeli Occupation, among many other factors. Decades of receiving conditional aid has automatically trained most of us not to seek our independence as a people with a sustainable future. But some local communities and solidarity groups here refuse to believe that. They insist on our right to control and manage our resources for a sustainable future. In fact, they all met here at Dalia Association on the 28th of May to discuss producing and consuming in a resistance economy today in Palestine, in collaboration with the Institut Français du Proche-Orient (IFPO) and Al Najjah University. They brought their experiences, knowledge, and above all hope for a better future to the round table discussions. They fervently suggested great ideas on how to better support a resistance economy today, by exploring tourism, rethinking agriculture, defining circular economy, using non-cash resources, sharing goods, services and knowledge, and building a local resilient economy based on nature, and what already exists in Palestine. These people are the ones who see the sun, they are the ones who are creating a bright future for Palestine. Aid Watch Palestine was awarded a sum of $2743 from the Dalia Association’s Gaza Fund, to use for documentation of stories, information, and for making a film on Gaza’s situation after the 2014 Israeli attack. • Generate a bit of income for the Dalia Association, decreasing our dependence on external aid. Donated spaces are welcome! If you have unused space that matches our needs and you have been wanting to use your resource (space) to support your community, we encourage you to contact us. We also plan to use this community space for some of our community meetings and gatherings. Please share any available opportunities with us by emailing us at [email protected] or calling us at 0595777051.